Still Available: Give Glock Firearms a call (number below) and ask for the mailing department. Leave a voice message requesting the Glock freebie pack including your name and mailing address. 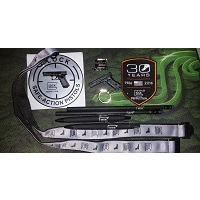 This pack includes a lanyard, pen, pencil, sticker, patch, and a Glock 17 keychain. Much to like about this freebie if you are a gun-lover. If you are not feel free to pass. 770-432-1202 from 8-4:30pm ET or / Sign Up Here Note: If requesting on website in the message box indicate that you are request the free promo pack.